But fear not. 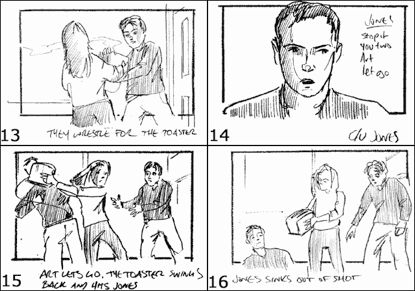 Today we look at five winning tips which, combined, will solve 99% of your storyboarding woes. Stop Being So Damned Nervous! Despite the fact that storyboards give many filmmakers sleepless nights, as with anything you just have to man up and get the job done. I’m not saying you can’t live without a storyboard – on rare occasions they can be overkill - but usually you’re doing yourself a disservice if you decide to forego one, and more often than not they’re essential. So, try and make friends with them as early on in your career as possible. And if you’ve never done one so far, who knows? You might enjoy it! This is perhaps the single biggest cause of hesitation when it comes to storyboarding, and understandably so if you don’t personally have an ounce of drawing skill. However, you’ll be surprised at the talents people hide – you might not have an abundance of MFA acting buddies in your address book willing to give their time up for free, but sometimes even close friends have an amazing proficiency in drawing that you never knew about, buried ever since high school. So do put the call for help out on your social media platforms. Obviously hiring a professional artist (particularly one with storyboard experience) is the best solution, but even if a) budget doesn’t allow for such luxuries, or b) nobody you know can lend a hand, don’t fret. Honestly! It doesn’t particularly matter as long as it gets the job done. A crudely drawn storyboard won’t kill a project as long it demonstrates strong ideas, but guess what will kill a film. Yup, this is legitimate advice (and something you can tell your partner when they ask what you’ve been doing all day). Graphic novels are, by their very nature, an exercise in effective storyboarding. 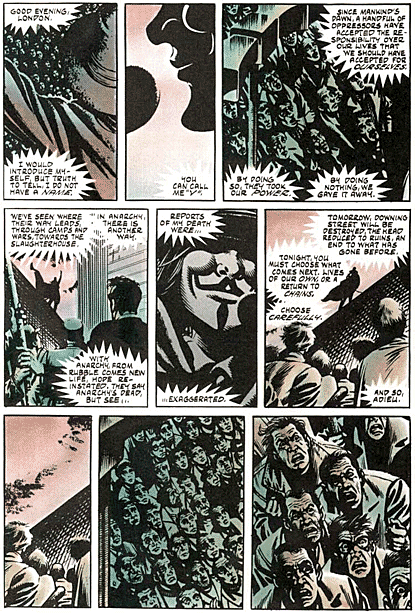 Alan Moore in particular is a great go-to example, since his work typically involves clever character framing, scene establishment, numerous focal depths and a mix of action and still shots. Taking it further, since a lot of his work has been adapted for the screen (much to the chagrin of Moore), you can really get a feel for how these images were translated onto film. If you’re attempting to make your finished storyboard reflect the script as much as possible; you are missing a good opportunity to have some fun. One of the many benefits of storyboarding is that it allows you to easily (and harmlessly) experiment with the film’s pacing. Got a bit of flashback exposition ten minutes into the movie? 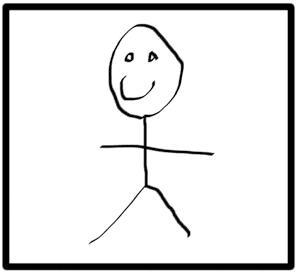 Try moving it to the 5-minute mark in your storyboard and seeing how it looks. Don’t like it? No problem – switch it back. But nine times out of ten, you’ll find this kind of playing around will kick start some niggling ideas which might end up helping you fine-tune the script. This is another issue born out of misunderstanding the point of a storyboard. When problems arise with illustrating a particular shot, or communicating an idea, a filmmaker can puzzle over what’s wrong with the perspective or the artwork itself for hours, having it redrawn over and over but still not getting any closer to solving the problem. This is counterintuitive. 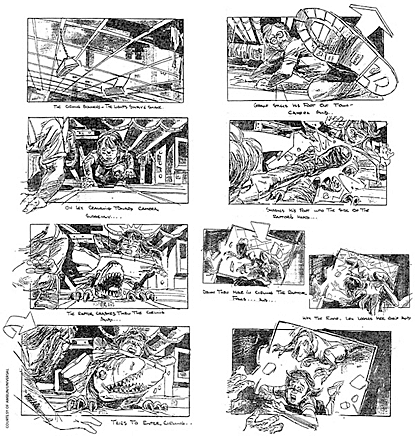 The storyboard is just that – an illustration of what you plan to shoot, and how you expect it to look. If it’s not looking good on paper, the root of the problem lies in the idea itself (or the script if a whole section of the storyboard seems off). And finally, don’t lament if these means you need to rework things from the ground up. You’ve just spotted a big headache ahead of time, which would have taken up a lot of time/money if you had to address it while on set. 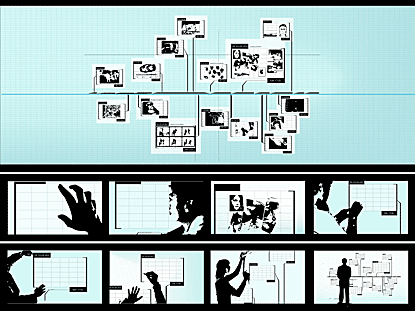 And that, guys, is the beauty of a good storyboard. Zeke Iddon is a film fanatic and consultant writer at New York Film Academy (www.nyfa.edu). He’s also somewhat of a comic nerd, hence the fondness for good storyboarding.